If you’re looking for a way to add decorative light to your space while still respecting the environment, LED flame lamps may be just what you’re looking for. The combination of aesthetic pleasure and energy-saving function is tough to beat. 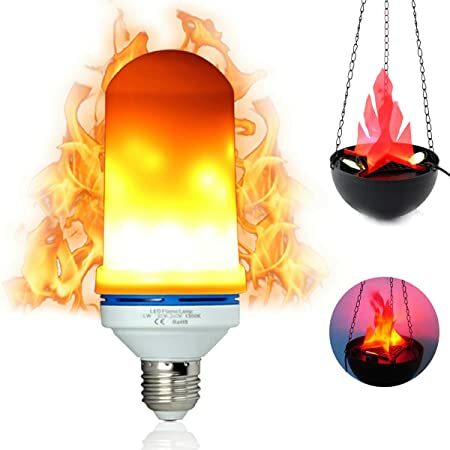 Read the top 5 best LED flame lamps reviews to find the right pick for your space. Energy Efficient: the main attraction of using LED bulbs is that they are super energy efficient. Rather than wasting electricity with standard bulbs that give off dim light, you can brighten your space with LED bulbs for a better value. LED bulbs use just 2 to 17 watts of electricity, which is ⅓ to 1/30 what standard light bulbs use! Cost Effective: saving energy means you’ll be saving money at the same time. Not only are LED light bulbs affordable, but they last longer than their standard counterparts and use less energy. 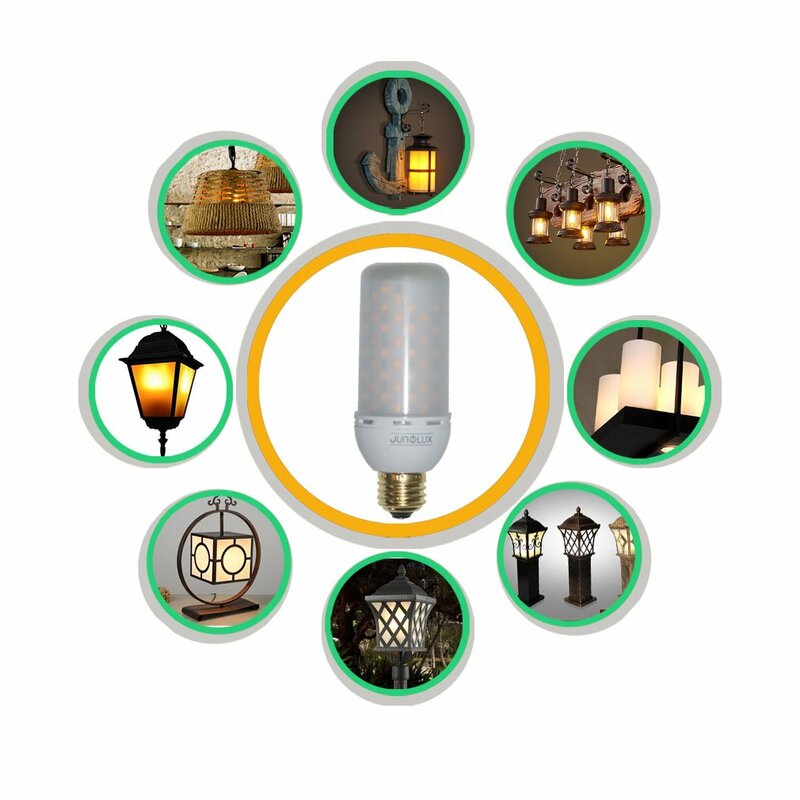 All in all, you save financially by using LED flame lamps. Cool: if you have children or pets, using LED flame bulbs is a smart choice because it prevents dangerous accidents. LED bulbs are often cooler to the touch than standard bulbs. They also generate less heat overall, which means you won’t feel the need to crank up the air conditioning as much during warmer months. Price: when it comes to making any investment, budget comes into play. LED bulbs are no different and you want to be sure that you’re paying for the quality you’re getting. Set your budget beforehand and search within that range. Lifespan: as you search for LED bulbs, you will notice that different bulbs offer different lifespans. LED bulbs are known for lasting much longer than standard bulbs, in general, but there is still variation between LED bulb brands. Keep an eye out for longer lifespans for the ultimate value. Versatility: LED flame bulbs add beauty and practicality to your space. You can take it up a notch by searching for flame bulbs that have different modes. This means that you will be able to choose the type of display you get with your flame bulb. 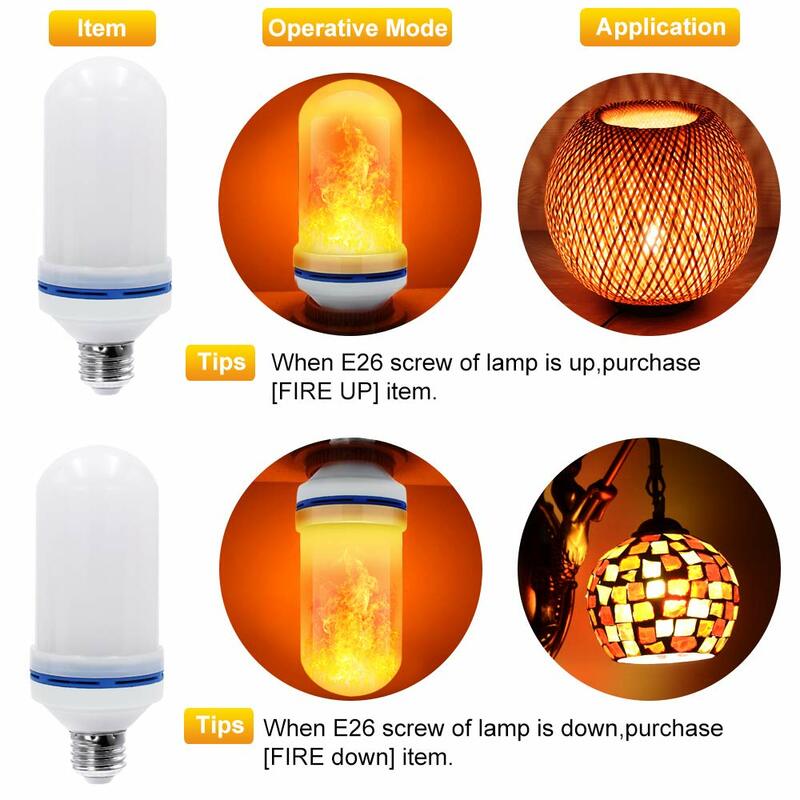 If you’re interested in LED flame lamp bulbs for their aesthetic purposes, then versatility should be important to you. 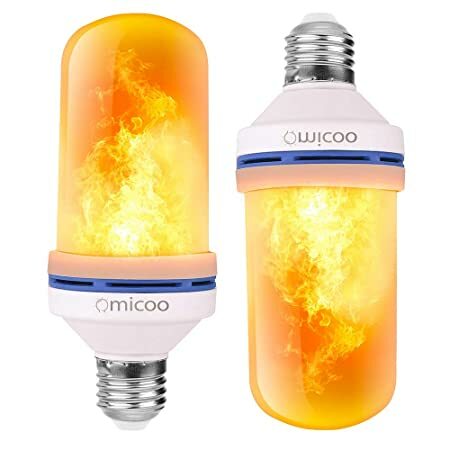 The Fuxury Omicoo LED Flame Effect Fire Light Bulbs are the best bang for your money. They come in a pack of 2 and are as updated as possible when it comes to LED flame light bulbs. These bulbs are totally environmentally friendly and are made without any harmful substances or UV and infrared radiation. You can use these bulbs in an LED flame lamp playland or use them for other purposes. You can even create a romantic atmosphere! The Fuxury Omicoo is definitely one of the best deals on the market for a pack of 2 LED flame light bulbs. The best part is you don’t sacrifice quality for the price. The lifespan of the Fuxury bulbs is 100,000 hours, which is very high in comparison to many competing brands. Fuxury bulbs run in 4 modes that you will see as you turn your LED bulbs on and off. They are ideal for use both indoors and outdoors, making them totally versatile. The CPPSLEE LED Flame Effect Light Bulb comes in a pack of 2, so you don’t need to worry about where your replacement will come from. You can even put the bulbs in two places around the house. Whether you’re trying to decorate a LED flame lamp candelabra or simply want to add a special touch to your space, these bulbs will do the trick. 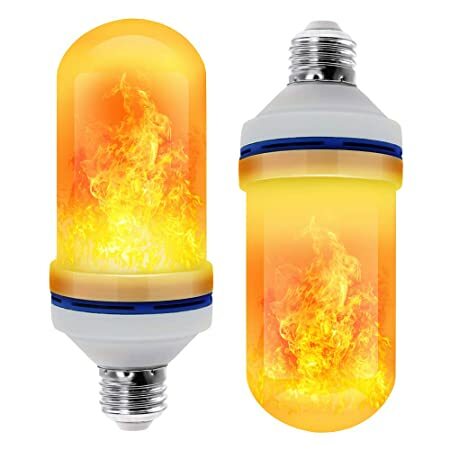 This flame bulb gives you the feeling of an open flame safely and without any UV or infrared radiation. In terms of price, CPPSLEE offers a deal that can’t be beaten. You get two bulbs for a value price. The lifespan of these bulbs is at the top of the range you often find in LED bulbs at 50,000 hours. You even get a warranty that lasts throughout all 50,000 hours of use! The CPPSLEE bulbs are an excellent choice when it comes to versatility. They work in four different modes. If you’re looking to replace a bulb or try flame light bulbs for the first time, check out the LUXON LED Flame Effect Light Bulb. You can try this bulb without stress, as it comes with a reliable one-year warranty just in case anything goes wrong. 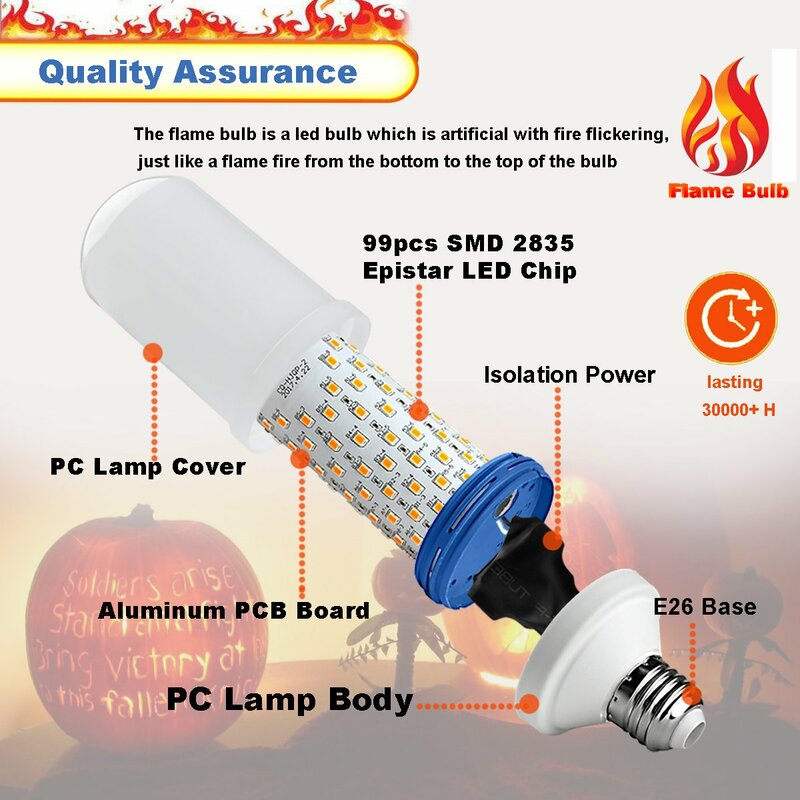 This bulb will create the feeling of being in the presence of a real fire without the unnecessary heat or safety risks. This bulb is energy saving and ideal for decorating various spaces around your home. The LUXON LED Flame Effect Light Bulb comes at a standard market price for single flame bulbs. It’s a fair price if you’re looking to invest in just one bulb at a time. The lifespan of the LUXON flame bulb stands up to many competitors at 50,000 hours. This means you will not need to worry about replacing it for some time. 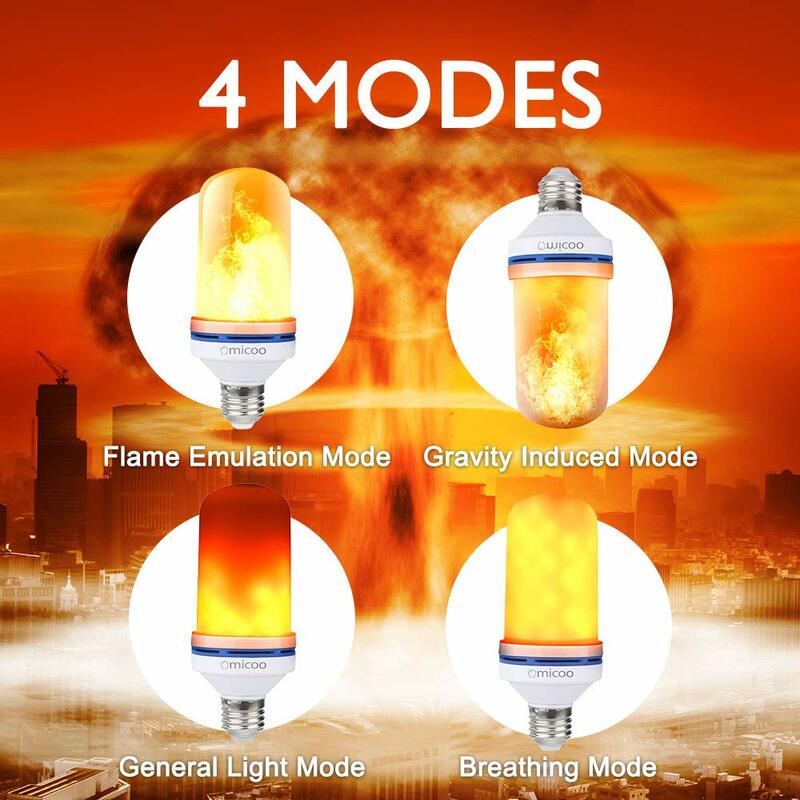 In terms of versatility, the LUXON flame bulb functions with 3 modes. This creates a unique cycle that adds beauty to any space. The LUXON bulb can be used both inside and outside in any space you can imagine! The JUNOLOUX LED Flame Light is a great option if you’re looking to try flame light bulbs for the first time. This bulb provides the look of a real flame and simulates the same dynamic movement you would see in nature. The sleek shape of the bulb makes it easy for use with different decor and lamps. The JUNOLUX bulb is safe and will keep your electricity bills down in the long run, while simultaneously sprucing up the look of your home. 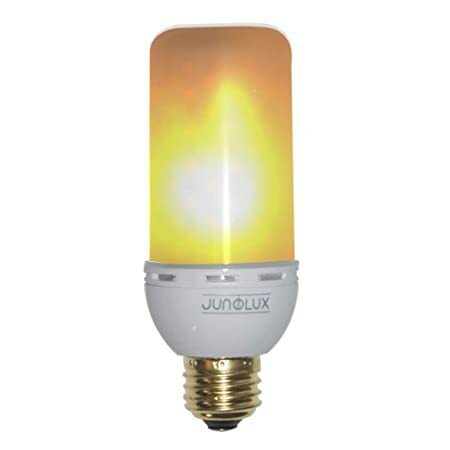 The JUNOLUX bulb comes as a single bulb and is reasonably priced. It is a practical price for trying LED flame lights for the first time or replacing an old bulb. The lifespan of the JUNOLUX flame light bulb is described as 5 years with about 5 hours of use per day. This is significantly less than some other brands but may also depend on the amount of usage. The JUNOLUX bulb does not have separate modes, it only flickers. That being said, it can be used in many areas of your outdoor and indoor spaces. 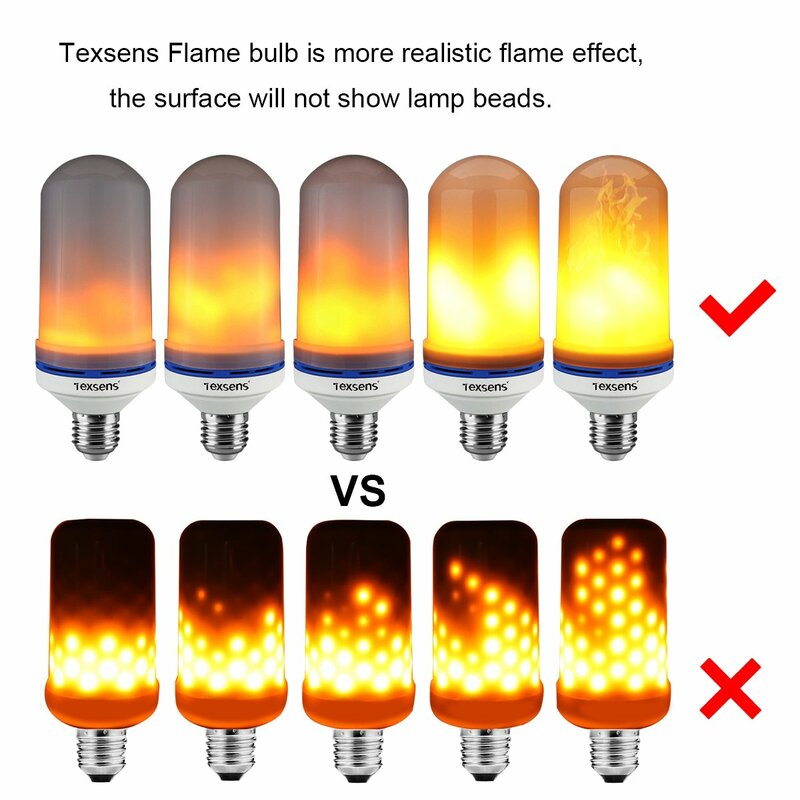 The Texsens LED Flame Effect Light Bulb is another option if you’re looking to invest in a one flame light bulb, rather than two. This bulb stands out from the crowd because it produces a more realistic flame effect in that the surface of the bulb does not show lamp beads like many other models. 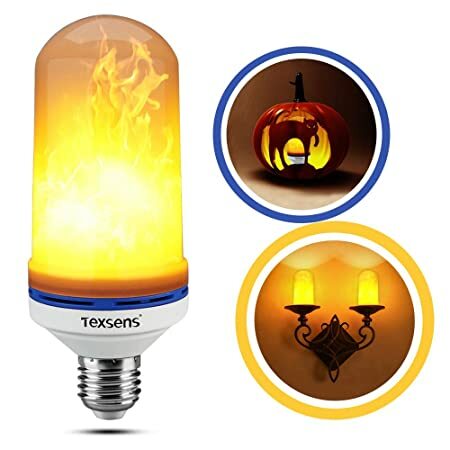 The Texsens LED flame bulb is safe for use both indoors and outdoors and will help you save on electricity while decorating your space. The Texsens flame light bulb rings in at a higher price than some of its competitors, so it may not be suitable for all budgets. The lifespan of the Texsens LED flame bulb is quoted as being long but is not specified in hours. However, customers do report long usage. The Texsens flame bulb can be used for many decoration purposes in any area you please. Keep in mind that it does not have various modes, so it will only flicker. Adding a flame light bulb to your space is an easy way to enhance your decor. Flame light bulbs are versatile and can be used for a variety of purposes from Halloween fun to set the romantic atmosphere during an at-home date night. Between the aesthetic and cost-saving benefits, you can’t go wrong with a flame lamp bulb!